Do you want to retire early? Starting your golden years sooner may sound enticing but it’s a difficult proposition. You’ll probably need to earn a lot, and you’ll definitely need to save aggressively and budget carefully. There are some states in the U.S. that are better suited for retirees, where your retirement savings would go further. 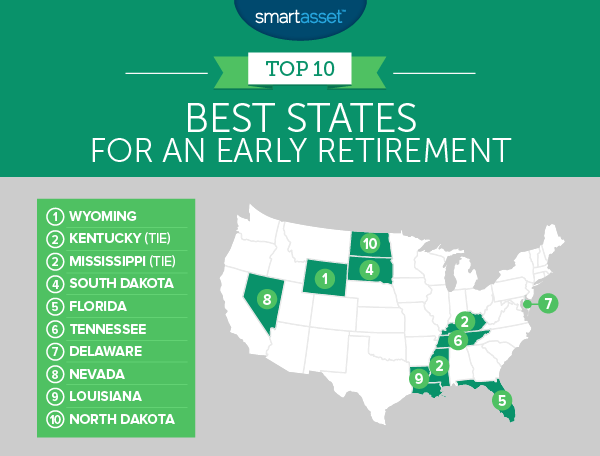 Below SmartAsset finds the best states for an early retirement in 2017. Thinking about an early retirement? A financial advisor can help you reach your financial goals. In order to find the best states for an early retirement, SmartAsset analyzed data on eight factors. We looked at effective income tax rate, sales tax rates, effective property tax rates, median annual housing costs, non-housing costs of living, healthcare costs and the number of entertainment establishments and doctors’ offices. This is our third annual best states for an early retirement. Check out the 2016 edition of the study here. Usual suspects – Our top 10 is dotted with many of the same states as last year. Only Texas and Pennsylvania lost their spots in our top 10. Replacing them are Delaware and North Dakota. Work in the Northeast, retire in the South – The Northeast contains some of the highest-paying jobs in the country. However, they come with high costs of living. Our data suggests if you’re looking to retire early, it may be a good move to consider heading to the South. Delaware and New Hampshire are the only Northeastern states in our top 20. Retirement is expensive – Even in the top 10 states, retirement is expensive. The average combined costs of health insurance, housing and other expenses run up a bill of over $33,000 across the top 10. If you want to retire somewhere pricier, say Connecticut, you’re looking at an annual bill over $45,000. For the second consecutive year, the Cowboy State takes the top spot for the best state for an early retirement. The biggest plus to retiring in Wyoming is that you can expect to pay a 0% tax on your income. In fact, taxes in Wyoming are very low in general. If you buy property, you’ll only have to pay 0.61% in effective property tax on average. The sales tax here is also low. In each of those metrics, Wyoming has a top 10 score. Plus, you probably won’t get bored living in Wyoming. Our data shows that Wyoming has the fifth-highest rate of entertainment establishments per 10,000 residents. For the second year, Kentucky secures another silver medal in the best states for an early retirement. The Bluegrass State has an average effective income tax rate of 0.97%, which is slightly higher than other states but is not a bad score. The best part about retiring in Kentucky may be the money you can save on housing. According to our data, average housing costs here are the fourth-lowest in the country at about $8,700 per year. Kentucky also has the 12th-lowest non-housing cost of living. Combine those two facts and it becomes clear that you can probably retire early in Kentucky without having an enormous sum in your 401(k). Unlike some places, you don’t need to be a millionaire to retire in Mississippi. The Hospitality State welcomes all potential retirees with offerings of 0% effective income tax rates, the lowest average non-housing cost of living and second-lowest average housing costs in the country. However be prepared to pick up some hobbies in your golden years. Mississippi, according to Census data, has the smallest concentration of entertainment establishments in our study. Access to healthcare in Mississippi may also be a cause for concern. There are only 5.5 doctor’s offices per 10,000 residents, the 15th-lowest rate in our study. South Dakota is friendly to retirees. For one, it doesn’t tax retirement income. Secondly, it’s a fun place to hang out, at least relative to its population. There are just under eight arts, entertainment and recreation establishments per 10,000 residents, the second-highest rate in the country. However South Dakota is another place that could work on improving access to healthcare. There are only three doctor’s offices per 10,000 residents in this state. That’s the second-worst rate. The most popular retirement state takes fifth. Famously, Florida does not tax income. But more than helping you keep money in your pocket, Florida is vigilant about keeping its residents and retirees healthy. There is only one state in the country (New Jersey) with better access to healthcare. There are just under 10 doctors’ offices per 10,000 residents in the Sunshine State. After all what’s the use of retiring early if you can’t stay healthy. Like its neighbor to the north, Kentucky, Tennessee is a great place to retire early because of its low cost of living. A low cost of living means you can retire in Tennessee earlier and with less savings. According to our data, the state has the third-lowest average non-housing cost of living. Plus, Tennessee is another state with a 0% average effective income tax. One concern: sales tax in Tennessee can make everyday items expensive. This state has the second-highest average state and local sales taxes. Delaware managed to secure a top 10 spot despite having the 23rd-highest average effective income tax in our study. This is because it has stellar scores in other metrics. While retiring early in Delaware may mean paying more income tax, it also means paying no sales tax and the fifth-lowest property tax. This state also has the 11th-highest concentration of doctors’ offices in the country. A number of factors make Nevada a great state for an early retirement. First the state has an average effective income tax of 0%. It also has the 11th-lowest property tax rate in the country. Furthermore, there’s good access to healthcare in Nevada. The state has the seventh-most doctors’ offices relative to population in the country. Our tour of the best states for an early retirement heads back south to Louisiana. When it comes to costs of living, Louisiana is hard to beat. This state scores in the top 10 for both average housing and non-housing costs of living. Louisiana does have the highest average state and local sales taxes in the country which hurts its score in this study. This Midwest state rounds out our top 10. North Dakota has above average scores in six of our eight metrics. Standout scores include the concentration of arts, entertainment and recreation establishments (5.9 per 10,000 residents) and average housing costs ($9,228 per year). In both of those metrics North Dakota ranks in the top 10. Average effective income tax rate for people ages 55-64. To calculate this we ran more than 32,000 simulations on our retirement income tax calculator. We simulated the potential state and local income taxes paid for people ages 55, 60 and 64. We used retirement incomes ranging from $20,000 to $80,000 per year. Health insurance costs. This is the average annual cost of a silver health insurance plan. We used the Kaiser Family Foundation’s health insurance calculator to calculate this. Using this tool, we estimated the cost of a silver plan for 60-year-olds across the five largest counties in each state. We did not incorporate any potential subsidies, which can vary from situation to situation. Average non-housing costs of living. Data comes from the MIT’s living wage calculator. Average annual housing costs. Data comes from the Census Bureau’s 2016 1-year American Community Survey. Average effective property tax rate. Data comes from the Census Bureau’s 2016 1-year American Community Survey. State and local sales tax rates. Data comes from the Tax Foundation and is from January 1, 2017. Doctors’ offices per 10,000 residents. Data comes from the Census Bureau’s 2016 Business Patterns Survey. Arts, entertainment and recreation establishments per 10,000 residents. This includes establishments like museums and sports arenas. Data comes from the Census Bureau’s 2016 Business Patterns Survey. Tackle your debt. Paying unnecessary interest payments on high interest items like credit cards puts a dent in your monthly budget. Tackle those as soon as you can so you can start saving more aggressively. If you are truly serious about retiring early, you will want to cut expenses. This can include smaller things like cutting cable or getting a less expensive cell phone plan. However, the biggest savers come in the two biggest budget items for Americans: housing and transportation. You may want to downsize to a smaller house or apartment or even rent out a room in your home to cut down on housing costs. You can also consider taking public transport to save on gas. Retire somewhere affordable. As this study showed location is important. Retiring to a tax-friendly, affordable location could mean the difference between being able to retire early or not. Finding a financial advisor also can help you retire early. 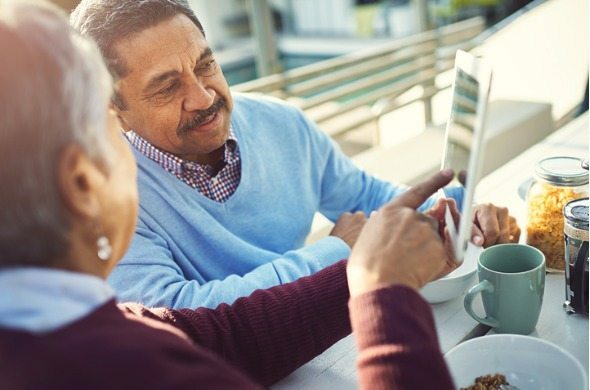 According to industry experts, people who work with a financial advisor are twice as likely to be on track to meet their retirement goals. Finally, consider a worktirement. Working in retirement can help you earn a little money on the side while staving off potential boredom.